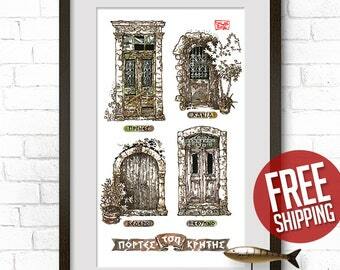 CRETAN DOOR #02, Old Village Door, Margarites, Old House Door, Giclée Print, Ink and Watercolor, Door Painting, Art Poster, FREE Shipping! ● Print sizes: 21x30 cm (A4), 30x42 cm (A3), 40x70 cm (original size). ● High–quality print on 300 gsm matt coated paper, unframed. ★ Buy 3 prints – get 1 FREE! ★ Buy 4 prints – get 2 FREE! ★ Buy 5 prints – get 3 FREE! ★ Buy 6 prints – get 4 FREE! ★ Buy 7 prints – get 5 FREE! ★ Buy 8 prints – get 6 FREE! ★ Buy 9 prints – get 7 FREE! ★ Buy 10 prints – get 8 FREE – the full set of 18 drawings! Please specify the drawing numbers (or the URL links) of your freebies into "note to seller" upon checkout. Or you can leave it to my discretion. This artwork was inspired by the amazing beauty of Crete, a sunny Greek island in the Mediterranean Sea. The drawings are made with ink and watercolor, however instead of using traditional tools like dip pens or ink markers, I prefer to draw by using handmade dry twigs cut by myself. "Who was that master, that great wood carver, that passionate artisan, who created these doors on the island of Crete?" M.M. The mantinada was written by Manolis Maragoudakis (age 65) from Vederi village, Rethymno, Crete, exclusively for this work. *The Cretan mantinades are 15–syllable rhyming couplets in the Cretan dialect of Greek. That's the unique way in which locals in Crete express their emotions of sorrow, joy, hope, desire, love, anger, revenge and nostalgia. According to historians, mantinades first appeared in the island of Crete in the 15th century, during the period of Venetian rule. Similar rhyming couplets are found on other Greek islands, however the difference in Crete is that this very old tradition is still alive today, especially in the villages. If you need a size not listed, please feel free to contact me. Custom size prints can be made on both paper and canvas. If you are interested in purchasing the original of this drawing, let me know. 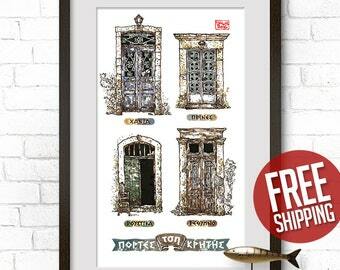 CRETAN DOOR #07, Rethymno, Venetian Style Door, Old House Door, Giclée Print, Ink and Watercolor, Door Painting, Art Poster, FREE Shipping! 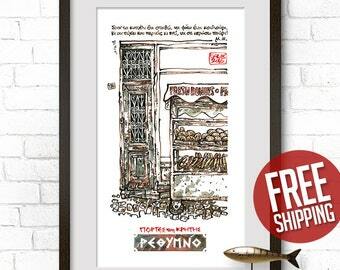 CRETAN DOOR #17, Rethymno, Venetian Style Door, Old House Door, Giclée Print, Ink and Watercolor, Door Painting, Art Poster, FREE Shipping! 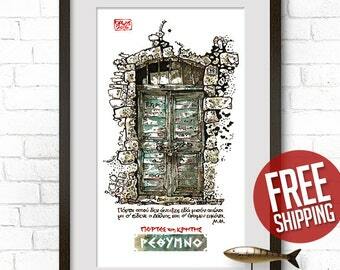 CRETAN DOOR #11, Rethymno, Venetian Style Door, Old House Door, Giclée Print, Ink and Watercolor, Door Painting, Art Poster, FREE Shipping! 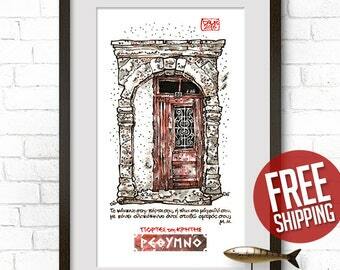 CRETAN DOOR #09, Rethymno, Venetian Style Door, Old House Door, Giclée Print, Ink & Watercolor, Door Painting, Art Poster, FREE Shipping! 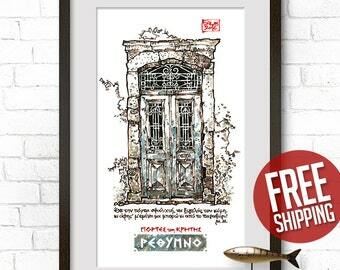 CRETAN DOOR #15, Rethymno, Venetian Style Door, Old House Door, Giclée Print, Ink and Watercolor, Door Painting, Art Poster, FREE Shipping! 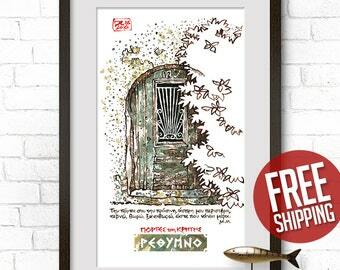 CRETAN DOOR #08, Rethymno, Venetian Style Door, Old House Door, Giclée Print, Ink and Watercolor, Door Painting, Art Poster, FREE Shipping! 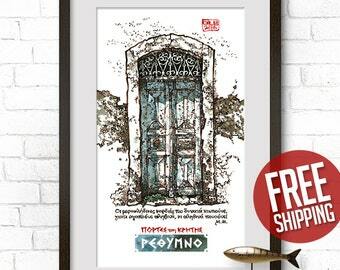 CRETAN DOOR #03, Rethymno, Venetian Style Door, Old House Door, Giclée Print, Ink and Watercolor, Door Painting, Art Poster, FREE Shipping! 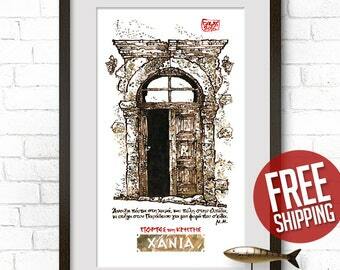 CRETAN DOOR #16, Chania Port, Venetian Style Door, Old House Door, Giclée Print, Ink & Watercolor, Door Painting, Art Poster, FREE Shipping! CRETAN DOOR #17, Venetian Style Door, Old House Door, Giclée Print, Ink & Watercolor, Door Painting, Art Poster, Home Decor, FREE Shipping! I ordered several Cretan prints from Dalius and I'm so very pleased with the design and quality of each one, but also, the great service Dalius offered. He followed up with me to ensure that I had picked the right print size (I hadn't!) and to help me pick the best designs. While we live in the US, we are from Crete and can attest to the authenticity and wit in these mandinades. It's really nice to feel like we have a piece of home here in the US. Thank you, Dalius! 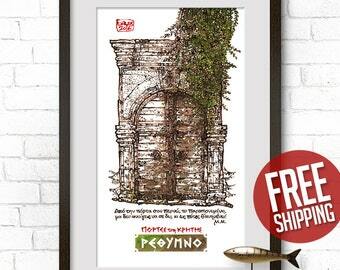 CRETAN DOOR #10, Old Church Door, Adele Village, Giclée Print, Ink and Watercolor, Door Painting, Art Poster, Home Decor, FREE Shipping! 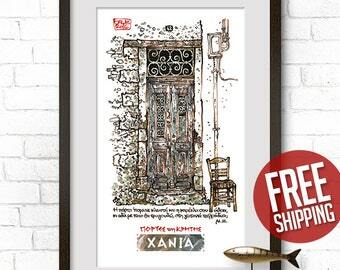 CRETAN DOOR #18, Chania Port, Venetian Style Door, Old House Door, Giclée Print, Ink & Watercolor, Door Painting, Art Poster, FREE Shipping! 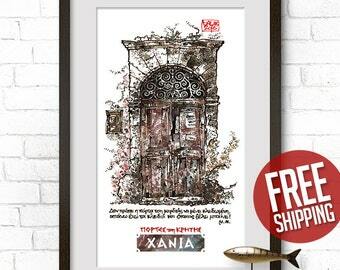 CRETAN DOOR #04, Chania Port, Venetian Style Door, Old House Door, Giclée Print, Ink & Watercolor, Door Painting, Art Poster, FREE Shipping! 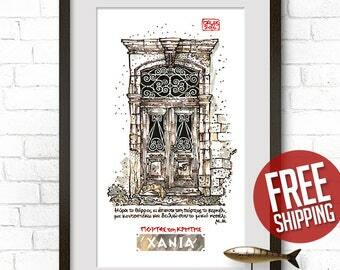 CRETAN DOOR #05, Chania Port, Venetian Style Door, Old House Door, Giclée Print, Ink & Watercolor, Door Painting, Art Poster, FREE Shipping! 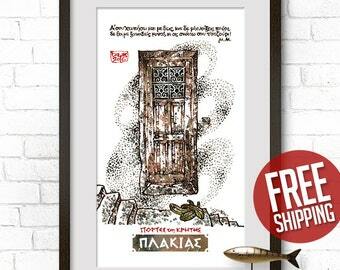 CRETAN DOOR #14, Old Village Door, Old House Door, Giclée Print, Ink & Watercolor, Door Painting, Art Poster, Home Decor, FREE Shipping! 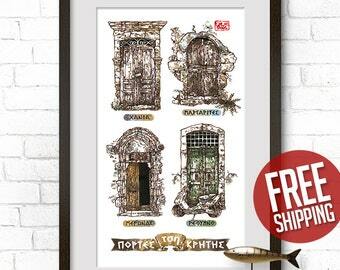 CRETAN DOOR #01, Venetian Style Door, Old House Door, Giclée Print, Ink & Watercolor, Door Painting, Art Poster, Home Decor, FREE Shipping! CRETAN DOOR #06, Venetian Style Door, Old House Door, Giclée Print, Ink & Watercolor, Door Painting, Art Poster, Home Decor, FREE Shipping! 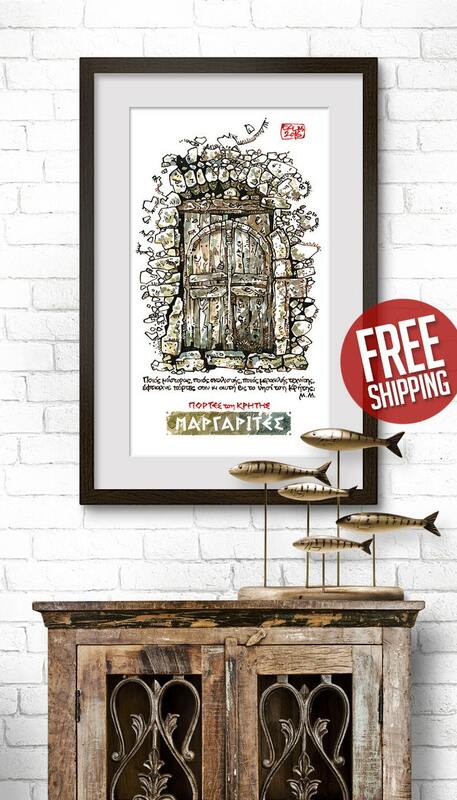 CRETAN DOOR #13, Venetian Style Door, Old House Door, Giclée Print, Ink & Watercolor, Door Painting, Art Poster, Home Decor, FREE Shipping!